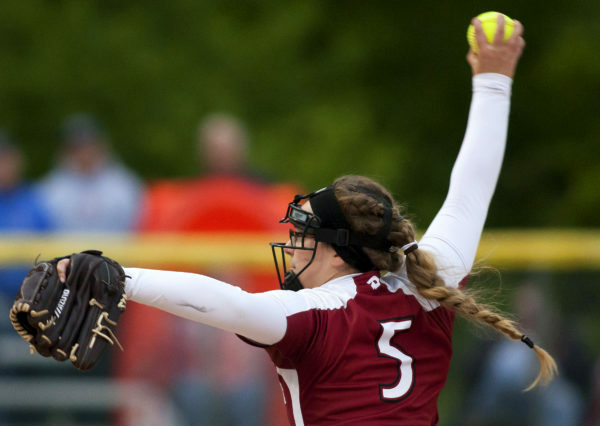 Brewer's Emily Lord connects with a pitch from Bangor during their softball game at Coffin Field in Brewer on Tuesday. Bangor's Morgan-Carter Moulton pitches to Brewer during their softball game in Brewer Tuesday. Bangor's Lindy Bezgumbluk connects with a pitch from Brewer during their softball game in Brewer Tuesday. 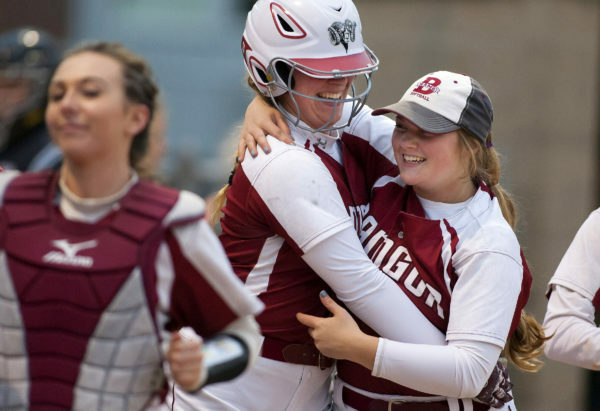 Bangor's Megan Conner (right) celebrates with Morgan-Carter Moulton after Moulton hit a home run against Brewer during their softball game in Brewer Tuesday. 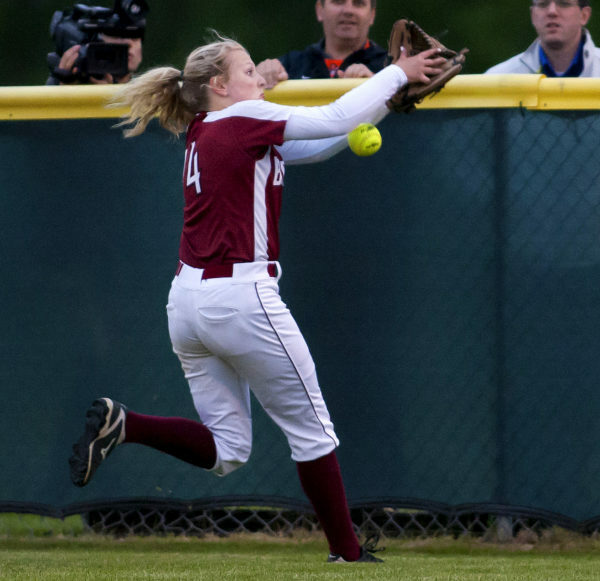 Bangor's Madi Drake can't get a handle on a fly ball from Brewer during their softball game in Brewer Tuesday. Bangor's Page Cadorette (right) is tagged out at home by Brewer's Jordan Goodrich during their softball game in Brewer Tuesday. BREWER, Maine — Brewer High School coach Skip Estes said this is the best hitting team he has coached in his 12 years at Brewer, and it showed on Tuesday night. 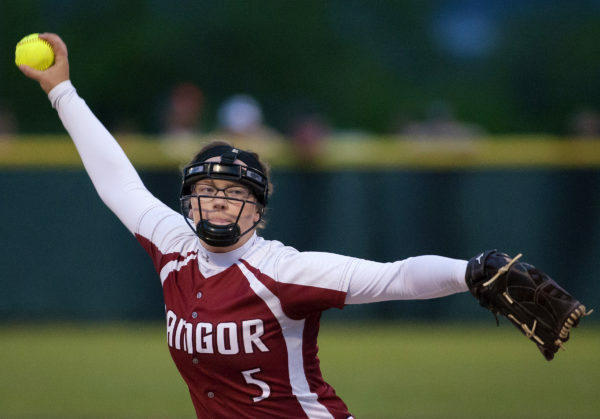 The Witches pounded out 12 hits and erased a 3-0 deficit to beat archrival Bangor 9-6 on Seniors Night at Coffin Field in the regular-season finale for both teams. Brewer wound up the regular season at 10-6 following its sixth straight win while the Rams fell to 11-5 while dropping their third in a row. 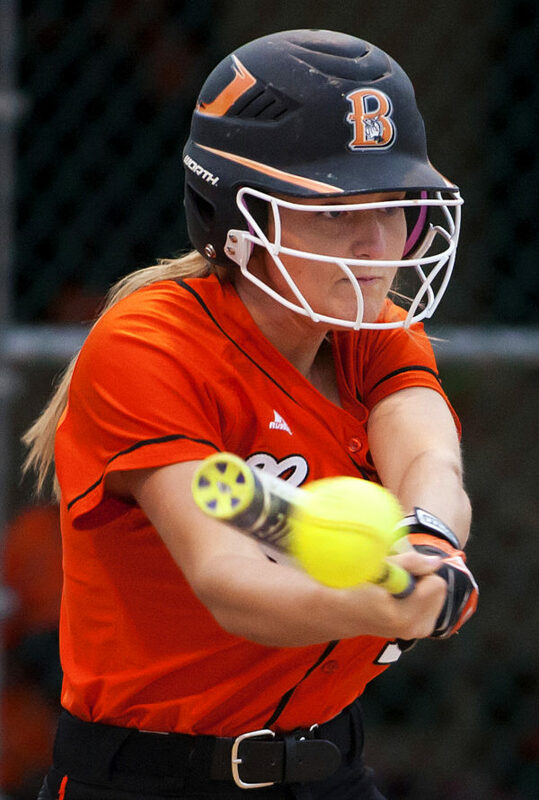 Junior center fielder Emily Lord had a pair of doubles and a single and drove in the tying run in a decisive five-run fifth-inning rally to spark the Witches. Junior designated player-third baseman M.J. Sellars chipped in with a pair of doubles and knocked in the go-ahead run in the fifth and freshman shortstop Kenzie Dore stroked a pair of singles including a two-run base hit in that inning. “After the last game against them (a 5-1 Bangor win on April 24), we really wanted to win this one,” Dore said. “We’ve worked real hard to get our bats going this season, and we really did that tonight,” Sellars said. With Brewer trailing 4-3 entering the fifth, Libby Hewes jump-started the rally with an infield single into the shortstop hole and Lord sliced a double down the right field line to drive her in. Two outs later, Sellars broke the tie by walloping a double to right center to deliver Lord. Sydney Hewes, Libby’s sister, made it 6-4 by pulling a line-drive single into right. Lexi Cunningham came on in place of Bangor freshman starter Morgan-Carter Moulton and an infield error extended the inning before a wild pitch moved the runners up and Dore ripped a two-run ground ball single into left. 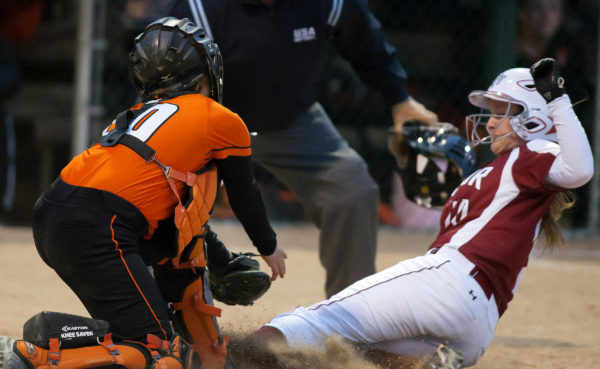 Bangor responded with two runs in the sixth on an infield error, a walk, Emma Payne’s crisp run-scoring single and Lindy Bezgembluk’s sacrifice fly into shallow center field. But the Witches added an insurance run in the bottom of the sixth on Lord’s double to right center, a wild pitch and Becca Gideon’s sacrifice fly to center. Bangor jumped out to a 3-0 lead with a run in the second and two in the third. In the second, Moulton singled and courtesy runner Cambria Prophete stole second and eventually scored on an error. In the third, Payne lined a double to left center and Moulton blasted a two-run homer to center. Brewer tied it with three runs in the bottom of the third on Jordan Goodrich’s base hit, an infield throwing error that put runners on second and third, Dore’s run-producing roller back to the mound, Libby Hewes’ RBI double off the center fielder’s glove and Crystal Dore’s RBI fielder’s choice. Bangor recaptured the lead in the fifth on Moulton’s one-out single, an infield error and Page Cadorette’s RBI single. “We made some uncharacteristic errors that cost us runs. Brewer put pressure on us and had some great hits,” Bangor coach Don Stanhope said. “When we made mistakes, to their credit Brewer did a good job capitalizing on them,” Bangor senior shortstop Payne said. Libby Hewes produced a single to go with her double and Goodrich had a pair of singles for Brewer while Sydney Hewes picked up the win in relief as she pitched 3⅓ innings of four-hit, two-run ball. 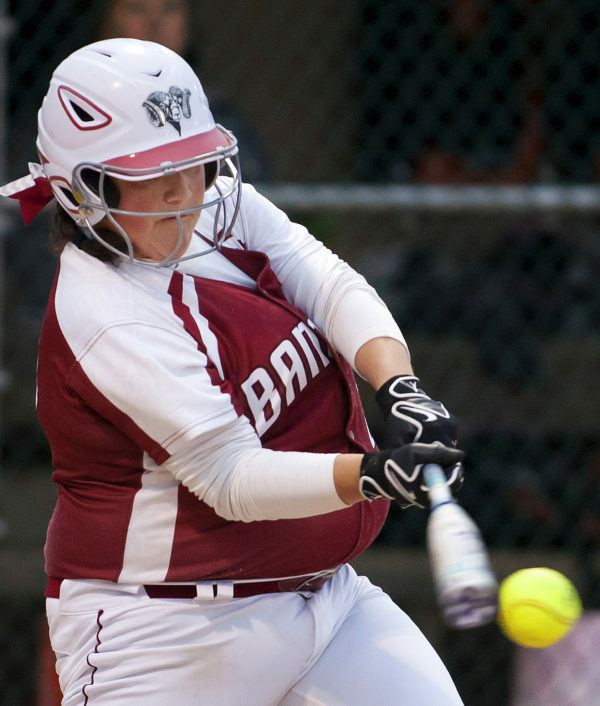 She replaced her sister, who fell ill in the middle of the game but stayed in to hit. Moulton had two singles to go with her homer, Payne doubled and singled and Grace Perron singled twice for the Rams.